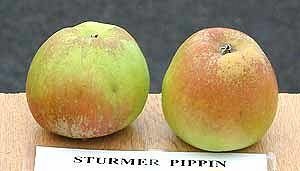 Sturmer Pippin - Apple Tree £12.75 - Dessert Apples - Late Season Apple Trees and Fruit Trees For Sale. Buy at competitive prices with wholesale discounts. 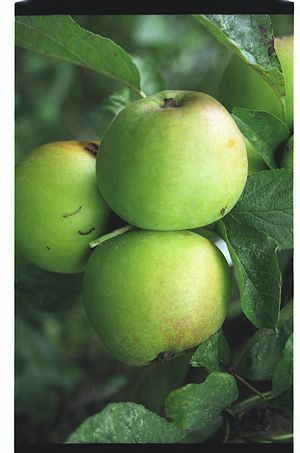 'Sturmer Pippin' produces a sweet, crisp and juicy green skinned apple. It's a very late cropping variety, fruit can stay hanging on the tree as late as January. This ensures the apple gets plenty of autumn sunshine, which in turn helps build up the sugar levels. In terms of flavour this apple needs to be stored until February/March to be fully enjoyed, if eaten too early it tends to be a bit hard and sharp. It is believed to have ‘Ribston Pippin’ parentage and was discovered in Suffolk in 1831, becoming a very popular Victorian garden variety.